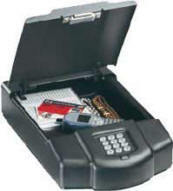 Compact, portable, and incredibly tough, the Gary Executive Safe is a must-have for any business executive. 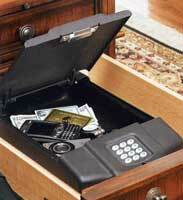 With the Executive Safe you can safely secure items inside a desk drawer - your PDA, cell phone, watch, computer disks, credit cards, and other valuables. The handy mounting system allows the safe to be easily moved from desk drawer to car trunk or nearly any location. Once the safe is locked into place, only those with the proper entry code may open it or move it. Other features include a lighted keypad, low battery alarm or timed system shutdown after the third incorrect code is entered. With the Gary Executive Safe, you can feel safe in your office or on the go. Dimensions 9" Height 15" Width 3.5" Depth Weight 16 lbs Capacity 400 cu. in. 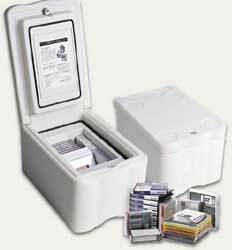 The MediaVault™ – compact, affordable, stand-alone storage safe that is designed to protect heat-sensitive valuables, including data and information storage media. Whether it’s microfiche, photographs or computer data on virtually any standard media (see chart on back), the MediaVault will protect it from dust and fires up to 1700˚F. The MediaVault is the only compact and affordable media safe of its size designed to meet Underwriters Laboratories® (UL) Class 125, one-hour specification for insulated record protection equipment. This specification ensures that the interior temperature of the storage device does not exceed 125˚F when exposed to a fire of 1700˚F for a period of one hour and during that time the interior relative humidity does not exceed 85%RH. 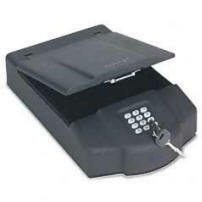 The MediaVault is also equipped with a key lock for added security and peace of mind.